If you were unaware of this celebration of all the work that taxonomists do, you can find more here, here and here. Every day in labs, museums, out on fieldwork, taxonomists are busy collecting, cataloguing, identifying, comparing, describing and naming species new to science. Some 300 taxonomists globally also contribute their valuable time to keeping the World Register of Marine Species up to date. Today is a chance for us at WoRMS to thank our taxonomic editors for this important task. And we celebrate the work of taxonomists now with the WoRMS list of the top-ten marine species described in 2018 as nominated and voted for by taxonomists! This top-ten list is just a small highlight of almost 2,000 fascinating new marine species discovered every year. Each of these marine animals has a story. 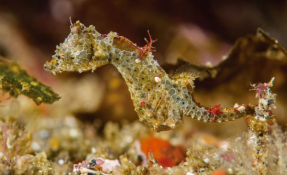 From the bizarre blanket hermit crab which uses an anemone ‘blanket’ instead of a shell for a home, the Hong Kong Sea Dragon, a species which is only the second to be described in its phylum, to a ‘walking’ deep-sea leech! A list of the 'Top Ten Species' described from ALL habitats and taxa has been announced annually since 2008. The oceans cover over 70% of the surface of our planet, and yet they still include the least explored regions. Although the ESF list often contains one or two marine species, we decided to pay homage to the ‘largest habitat on earth’ by producing our own list of the top marine species. We hope some of our favourites will make it to the global list! Curious about the actual list? Quickly check out the full press release on the LifeWatch website (see link below)!